Tara Costa caught America’s attention in 2009 on NBC’s popular television show, “The Biggest Loser” when she won a record-setting eight straight competitions and was ultimately named second runner-up. Audiences were inspired by Tara’s incredible transformation from 294 lbs to 139 lbs by the season finale. The show was over, but Tara’s journey had only just begun – she ran the NYC Marathon the same year, and this past October she took on the Ironman triathlon at the World Championships in Kona. Tara was declared an Ironman with a finish time of 13:56. She completed the swim in 1:24, the bike ride in 6:50, and the marathon in 5:13. We caught up with Tara recently to talk about her journey from “The Biggest Loser” to the finish line at Ironman Kona. TrainingPeaks: What made you decide to do an Ironman? Tara Costa: I had the opportunity to watch a friend compete in Ironman Lake Placid in 2009. I was cheering on all the athletes throughout the day and witnessing all the different types of people tackling the 140.6 challenge. Then the clock was getting close to midnight and I got to see all the Cinderella finishers. I was so moved by seeing these athletes cross that finish line – I knew that I wanted to experience that. I am the type of person that continually likes to challenge myself and I wanted to hear Mike Reilly tell me I was an Ironman! TP: How did you train for Kona? What was your fitness base going into it, how long were you training, and how did you track and monitor your progress? Tara: Training for Kona was intense, but luckily I had a great coach and group of people to help me. My coach would have me training about 6 days a week, usually having 2 workouts a day of varying intensities – either a run/swim brick, bike/swim, or a run or bike or swim/cross train combination. I started training in April and had a pretty solid running base but I was starting from scratch with the bike and swim. (I actually didn’t really start swimming until June, but shh, don’t tell my coach). I used TrainingPeaks to help monitor my training and communicate with my coach. Using TrainingPeaks is similar to life in the Biggest Loser ranch. Jillian used to give us homework assignments and we were accountable to her. Now I have a coach who I’m accountable to and who gives me workouts which I receive from TrainingPeaks every day by e-mail. I think the most important aspect of my training was having a coach that could help me re-arrange my schedule if I couldn’t make a workout because of work, and it helped with accountability. He has actually inspired me to get my USAT coaching certification so I can help others realize their goals. TP: What was the biggest challenge you faced going into training and how did you address it? 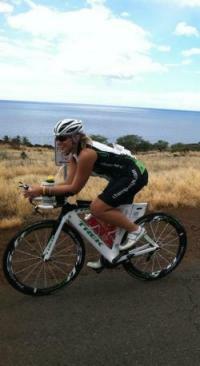 Tara: Training for Kona presented many challenges. Every time I felt like I was on a roll, I would get knocked down again. One of the worst moments was when I was one my last long bike ride before flying out to Hawaii. A car actually hit me while I was riding my bicycle. I just felt like it was me against the world, but then I quickly realized that attitude was a pity party. So every time that I got knocked down, I got back up. I continually had to check my attitude and make sure it was positive or else I knew I wasn’t going to succeed. “Have a positive mental attitude” is my motto and I try to execute it on a daily basis. It is amazing what a simple attitude change can do. TP: What was harder: “Biggest Loser” or Ironman training and racing? Tara: This is a difficult one to answer as they were both very different yet similar. The show helped me realize that I could push my limits to the unknown and be successful. I knew that no matter what, when I got to the run in Kona, I would finish because numerous days while on the show I would walk for hours. What was easier about the show is that I was able to see a constant improvement by the pounds dropping on the scale, but with IM training it took me awhile to see myself get faster on the bike. What was more difficult about Ironman racing is the triathlon environment; sometimes it is a tad bit overwhelming with the aero helmets, spandex, compression gear, fancy wheels and gadgets. When it comes to weight loss all you need is a good sports bra, comfortable clothing, a scale and pen/paper! TP: What are you doing these days training- and nutrition-wise to keep yourself in shape? Tara: I am currently getting my Masters in Physical Education and becoming certified as a USA Triathlon Coach, running coach, and a personal trainer. I have found through my body appreciation coaching (www.thegreateru.com) that the more I help others achieve their goals, the easier it is for me to achieve my own. Since it is very cold right now in New York, I am running, spinning and cross training indoors. As far as nutrition I believe in the 90/10 rule – 90% of the time I will be excellent with what I eat, but 10% of the time I can have whatever I like. It makes it a lot easier when I go out on a Saturday night for dinner! I think it is also important to practice nutrition as the fourth discipline in triathlon, but not only during training or racing but in everyday life as well. I make time for workouts, but also treat cooking for the week as another non-negotiable workout. TP: What would you say to any of our readers who want to run their first marathon, complete their first tri, or do their first Ironman this year, but don’t know if they have what it takes? Tara: If you would have told me 2 1/2 years ago that I would complete an Ironman in 13 hours and 56 minutes, I would laugh in your face and tell you, “No. I can’t do that.” What has to change first is the belief within yourself. Start saying, “I will”; no more “I can’t.” I never dreamed of the life that I am currently living today. A part of it is that I was blessed with an amazing opportunity but the other part is having a positive mental attitude and believing that “just for today” I can do anything. Believe in yourself and start today. Whether it is just a 5K or an Ironman, take it one day at a time and don’t wait to start tomorrow. Go out there and start today!! TP: What’s on tap for 2012? Tara: In 2012, I hope that I can help even more people accomplish their first running race or triathlon, but more importantly, help them feel like they can accomplish anything that they set their mind to! It also seems that I will have a lot of miles to accomplish in 2012. On New Year’s Eve, I posted on my Facebook page, “For every ‘like’ that this status gets, I will do one mile of running in your honor during the month of January & February! I challenge you to do the same! 2012 is the ‘BE YOU’ year”. After posting this on NYE around 6:00 p.m., I ended up with 2,247 “likes” by midnight. I have decided that I will complete all of the miles within the year, because that is just way too many miles for two months! In 2012 I will also continue with motivational speaking throughout the country – I love traveling and hearing other people’s stories about their life-changing experiences. In addition, I want to continue to build my Inspire Change Foundation and get as many people involved as possible. 2012 is going to be another year where I will make a difference and I cannot wait to see what is in store. And who knows, maybe there is another Ironman in my future. You can keep up to date with what Tara is doing by following her on Twitter or liking her page on Facebook. Tara used TrainingPeaks’ online training and nutrition software to help her track, monitor, and analyze her training for Ironman Kona. Learn more about our Software for Athletes here.